Pine Haven Christian Communities is a not-for-profit organization. Our mission is supported by area volunteers, organizations and businesses, and through generous endowments and donations from many sources. You can help Pine Haven through a donation of your time - by volunteering - of through monetary gifts to our foundation, our resident assistance fund, or our capital campaign for the Haven Drive Expansion project. There are many ways that you can give back to Pine Haven Christian Communities - through time or financial contributions. Pine Haven Christian Communities are sustained by significant volunteer assistance. If you would like to give of your time, knowing that you'll truly be helping improve someone's life, we urge you to read on about how to volunteer at Pine Haven, or contact us. The majority of people choose to offer an immediate gift to Pine Haven in the form of cash, stock, or property. Your donation can be sent to the foundation office at 531 Giddings Avenue, Sheboygan Falls, WI 53085 or made easily with the link on this site. For online contributions, you can choose to have the amount deducted annually, semiannually, quarterly, or monthly. Please keep in mind that donations we receive through a credit or debit program do result in a fee for us so using check or cash means a larger direct donation to Pine Haven. This type of donation has an additional benefit of tax savings through a charitable income tax deduction and makes it an attractive gift option for donors. We have developed a simplified transfer process that our foundation representative can go over with you. For example – if you purchased stock years ago for $1,000 and today it is worth $10,000, an outright gift of the stock to Pine Haven would mean a charitable contribution deduction of $10,000 for you. And, there is no capital gains tax on the $9,000 of appreciation. The gift of land or other property, while a less traditional means of giving, may offer tax and estate planning benefits for you and provide a substantial form of assistance to the foundation. Please contact our Roger Leys at (920)550-5203 to review the arrangements necessary to make the transaction possible. Planned giving may benefit residents ten, twenty, even fifty years from today. Through planned or deferred giving you can leave a lasting mark on the history of Pine Haven. Once you have set aside assets to care for your needs or those of your immediate family you may desire to utilize this type of giving. Should you choose to include Pine Haven in your estate plan, you will become a member of the Pine Haven Legacy Circle. Since these types of gifts require advance planning, please call our foundation office at 467-2401, ext. 203 and we’ll arrange a meeting with you. Please notify us when you include Pine Haven in your estate planning, so we can properly recognize your future contribution in an immediate manner. If you value and admire the work we do, then adding Pine Haven to your will or trust is a thoughtful way to be remembered. We have helpful information including sample bequest language to share with your legal counsel on the optimum way to do this. Utilizing life insurance, a retirement plan, or other assets to name Pine Haven as a beneficiary is a gratifying way to make a future contribution. There is a dual benefit to this gift option — you have income for a designated term of years or throughout your entire lifetime and then the balance of the trust is transferred to Pine Haven and helps others far into the future. For example – Say that you are age 75 and had purchased stock years ago for $10,000 and today it is worth $100,000. But, you only receive $2,000 per year in dividends, or a 2% yield. By transferring the stock to a charitable remainder trust and specifying that you want a 6% return for life, you could: triple your annual income (from $2,000 to $6,000); avoid the capital gains taxes that would be incurred on the stock sale; and be entitled to a charitable contribution deduction of about $55,000 (the actual deduction amount depends on your age, the rate of return specified in the trust, size of the gift, and other factors). Often viewed as the opposite of a charitable remainder trust, this vehicle allows you to donate the earnings on specified investments to Pine Haven for a period of years, with the principal and any growth it has realized then reverting back to you or your heirs. The benefits to you include the reduction or elimination of the transfer taxes (estate and/or gift taxes) and the ability to make a current gift. For example – You contribute $1 million to a 20-year charitable lead annuity trust to benefit Pine Haven Christian Home. 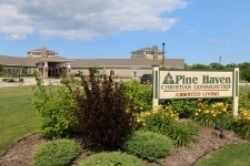 The trust agreement states that Pine Haven receive $70,000 annually. At the end of the 20-year term, you or your heir, receive the trust principal. For gift tax purposes, only the remainder interest (what the IRS estimates the value of the trust principal will be at the end of the trust period) is subject to tax. In this case, Treasury tables project the value of the remainder to be $222,540. The trust principal, however, actually grows to $2,597,230 (assuming a 3% annual net return), and this is what you or your heir receives. When you remember Pine Haven in your estate planning, you help us to plan for the future, and that of our residents. The information presented here is offered as samples of a variety of planning scenarios only, and is not intended to be individual legal advice. We encourage you to work with competent legal counsel during your estate planning.